Parking Safety Matters campaign reminds drivers not to leave children in sweltering back seats this summer. 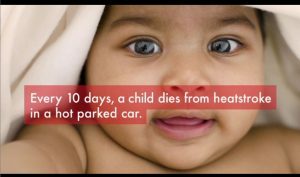 On average, a child dies from heatstroke in the back seat of a parked car every 10 days, and the death toll typically rises to two per week from May to September. Sixteen children have died this year already and summer is just beginning. 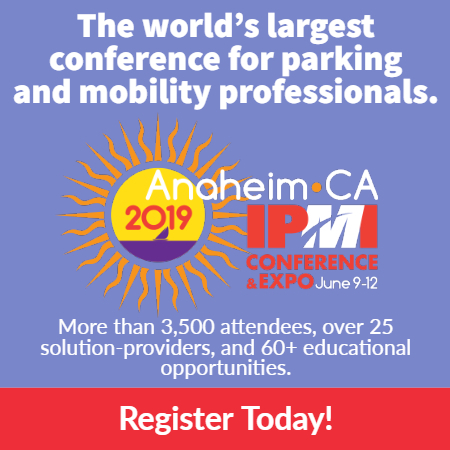 To help prevent these tragedies, the International Parking Institute (IPI) offers public service TV/online, radio, and print ads aimed at increasing awareness of the dangers of leaving children in parked cars. Download print, radio, and TV PSAs at www.parking.org/safety. Statistics show that most of these tragedies occur when parents or caregivers are distracted or preoccupied and simply forget that a child is in the back seat. In some cases, the victims were intentionally left behind, perhaps because they were sleeping or parents thought it was safe to leave them unattended while they ran a quick errand. Some children die after gaining access to an unlocked parked car. For a child, whose body temperature rises three to five times faster than an adult’s, heatstroke can be fatal at temperatures starting at 104 degrees. IPI’s Parking Safety Matters program has worked to heighten heatstroke awareness since 2014. 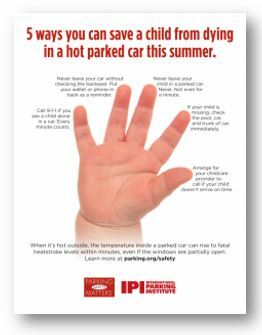 A fact sheet on heatstroke in parked cars is also available at parking.org/safety. IPI members are encouraged to share this information within their communities and with local media outlets.